Even though we only seem to be flirting with cooler weather, my thoughts are turning to foods I avoid in the summer - soups, stews, and all manner of braised dishes. I feel like puttering around the house while enticing smells emanate from the kitchen. I want to linger over meals that are more hearty than those I have been eating for the past four months. This isn't the most beautiful dish in my repertoire, but it is one of my favorites. Serve it with mashed potatoes and buttered green peas for a delicious meal. and save this liquid to use later in the recipe. Rinse the mushrooms in several changes of fresh water, remove any soil that may still be clinging to them, and dry the mushrooms with a clean kitchen towel. Put a glug of extra virgin olive oil in a pan that will hold the sausages without their overlapping. Add the sausages, and turn the heat to medium. Cook, turning the sausages frequently, until they are browned all over. Marcella recommends that you prick the sausages, but I personally follow the Nigel Slater policy on this and don't puncture them as I think the sausages stay more juicy if you don't. Try it both ways if you like to see which method you prefer. As I said above, serve with mashed potatoes. I make mine using an Oxo Potato Ricer, which I think ensures a perfect texture. You can add warm butter and cream (or cream only, which I do often) and stir with a wooden spoon, or you can go one step further and mix with a hand beater or put through a tamis if you have one. Irresistible! Sausages, wine, mushrooms. What else do we need for fall? Have you ever made your own sausage? Carlo's playing with the idea of trying it out, but I must say I feel a little leery. Seems like so much work! Of course, if I had a few more dishes like this one in my repertoire like this one, maybe I'd decide it's worth it. 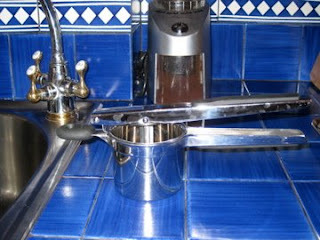 Oh, I commented so fast I did miss the potato ricer. I've never tried the oxo one.. I have one I got for 25 cents at a garage sale. It's got holes all around its sides too, not just on the bottom. I wonder if that makes any difference in the texture of the potatoes. 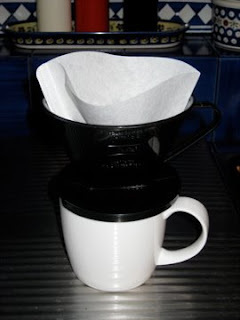 Using a coffee filter is so smart! I never would have thought of that. As soon as it's not 80* friggin' degrees here... I'm making this.